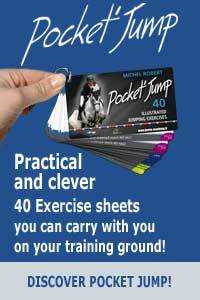 Being capable of riding one’s horse towards a jump, starting with a pole on the ground, calm and straight, and maintaining a quality canter, is at the basis of all training. When I come across a problem with a horse, before actually trying to solve the problem on the fence itself, my first reaction is to analyse the quality of its canter. I very soon discover that this is where the solution lies. 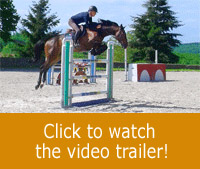 A horse that canters correctly will find jumping much easier. It is simple to recognise the quality of a canter: you should feel as if the horse itself is moving forward and at the slightest request from the rider it is capable of lengthening or shortening its stride and of turning left or right. With a good canter, the rider no longer needs to do anything to ensure that the horse keeps the same rhythm or remains on the right track. to keep the pace, or one’s hands to correct its direction when turning. The same of course applies whatever the gait. hindquarters well underneath. These horses are capable of galloping over damp and slippery ground without studs. The ideal horse, however, is rare. Although not all horses are endowed with these qualities, luckily it is possible to teach them to canter correctly by suppling and muscle-building exercises. Once again, one must not look for excuses, horses with problems such as bad balance, pulling, bolting, changes of rhythm, are in most cases the results of the rider’s own attitude. To teach my pupils the awareness of a quality canter, I prefer to have them ride on a circle. I ask them to lengthen and shorten the horse’s stride, to execute sharp turns on increasingly smaller circles. In the beginning, if I ask them: «Are you ready to slow down?... To turn left? ...» the answer is generally: «No». This happens simply because the rider, due to his mental and physical attitude, only has one choice: turning right or left. In his mind nothing else matters, to the detriment of all the rest. It is instead important to have an overall view of the current situation, to be open-minded and ready for any-thing. Even being prepared to do the opposite of what one is doing: if one is ready to slow down, one must be ready to accelerate; if ready to accelerate one, must be ready to halt. To achieve this, the rider must always maintain the centred position, allow-ing one to deal with any eventuality. If you are cantering correctly, you do not only have one, but thousands of possibilities, try it out! Test this! The exercise I consider the simplest consists in cantering on a circle with a diameter measuring between 15 and 20 metres. I begin by placing two wings without poles on the course. The rider must ride between the wings maintaining the same cadence at a working canter. I then place a pole on the ground between the wings asking the rider to remain in the same frame of mind before, during and after riding over the pole on the ground. The pole is the horse’s problem, not the rider’s. Consider that for the rider this pole only has the importance one gives it. The same in fact applies to all fences. To re-establish these conditions on each landing, I ask the rider to remain concentrated, imagining that after this fence there is a large oxer to be jumped. When a quality canter is obtained, jumping becomes easy. Problems caused by strides and distances become practically non-existent. There is nothing left for the rider to do: no need to use one’s legs, one’s hands, no need to become agitated, only the need to think, to control speed and direction. The priority is to maintain this canter until the take-off point, and to be able to analyse what happens, including when landing. Contrary to one’s habits, often acquired but rarely corrected by riders and instructors, it is important to maintain a clear mind (a wide-angle view) after each jump. Problems arise mainly due to a lack of discipline on landing: «Oof !... I’ve jumped the fence», and the rider gives up. From that moment on, the horse no longer feels his presence and can decide for itself and continue as it pleases. Get into the habit of carrying out little verification tests. When landing after a fence, check that you are able to stop or to come back to the walk, or to ask for a flying change at a certain precise spot.